We hope you will join us for a day of fun as we celebrate World Card Making Day! Any day that celebrates paper is a holiday worth having a party for! We’ve got a party planned, so clear your calendar and join us. Starting at 11 am (MDT) and running through 3pm (MDT), we will be posting cool card techniques and free cutting files every hour on the hour here on the blog. Come learn something new and grab your free files. The files will be free for everyone to download and will be offered in WPC, AI and SVG format, so anyone with a digital cutter can play along. We’ll have several chances to win some prizes as well. The party will be from 11am to 3pm Mountain Daylight Time (MDT). You can use the World Time Converter to check the time for your area. Craft Room Members and free forum members can join us in the Member Chat area for extra fun and games (and more prizes). Chat with Klo and Michelle, get to know one another, and play games for extra prizes. If you are not a Craft Room member be sure and register for a free forums account before next Saturday so you can play along. 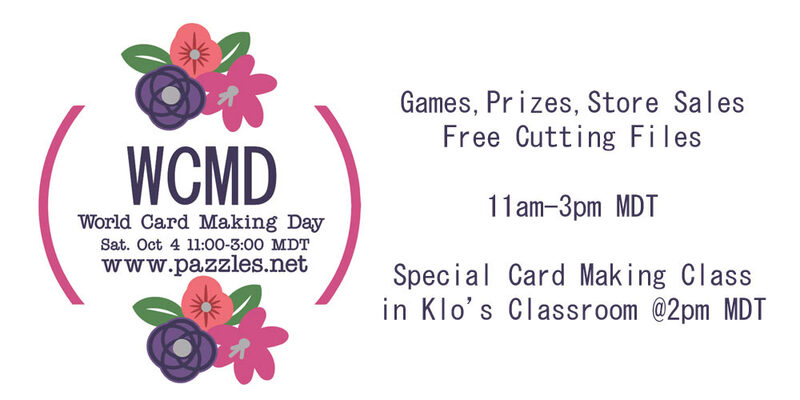 At 2pm (MDT) Pazzles Educator Klo Oxford will be teaching a live class on a fun card making technique. Click here to go to the Classroom page with instructions on how to enter the live classroom. The classroom will open shortly before 2pm (MDT) and stay open for a while after the class so you can share the projects you’ve created throughout the day with one another. Help us spread the word about our WCMD activities by sharing with your friends. Use the social media buttons at the bottom of this post to tweet, share, pin and email this event to all your paper friends! How long will files be available? I hope to be able to participate, but that day is also the CK convention in Kansas City (where I bought my Pazzle last year) and I had already enrolled in some classes there. lauribuck-there will be no time limit on the files!